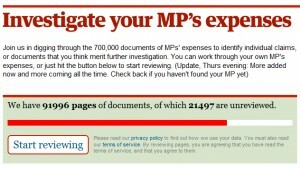 I’ve been doing my bit for transparency and democracy in the last day or so, using the Guardian’s crowdsourcing tool to scour the thousands of documents related to MP expenses. I’ve reviewed just over 300 pages. It’s taken me a fair few hours. Here are a few reflections. Great swathes of documents are tedious and I’m more keenly appreciative of what the Telegraph achieved when they reviewed the documents. Regarding the expenses themselves, there’s a lot of stationery. Outrageous amounts of stationery. There’s a lot of blacking out, but for the most part, the nature and amount of the documents is clear. Only a few are totally meaningless with some of the information redacted. Claiming for food (often up to £400 monthly max permitted) without receipts isn’t rare and an extraordinary perk. But more seriously, monthly claims for £250 petty cash without paperwork seem commonplace. For perspective, Jobseeker’s Allowance is £64.30 a week. I found a few fun claims: £860 sofabed, £200 deckchairs and for reasons unknown an XL hi -vis jacket for a tenner. Safety first. On a more geeky bent, and whilst totally supporting the Guardian’s brilliant initiative, the tool needs some tweaking. Of course, it’s been launched with remarkable speed but things like choosing the date are terribly cumbersome. Also, with such a volume of documents, I would appreciate a quicker way of flagging the numerous boring and uninteresting pages. Classifying a document adequately as a claim form coversheet of no interest takes 3 clicks. That’s two too many. I agree with much of what That Canadian Girl and Paul Bradshaw have written but this is only day two and we’re something like 10% through the task in hand. The gauges showing how many, and what percentage, of documents have been reviewed in total and by MP are fun. It’s a very engaging way of visualising progress and certainly spurred me on to complete certain sets of documents. But if I’m going to do 300 more documents I need a bit of loving. I’d welcome a chance to communicate with other reviewers to share best practice (that could be a forum or a wiki) because I have passed over a fair few documents because I don’t really know what to do with them. There’s perhaps also scope for a tool to flag tricky pages to others for peer review. Also, let’s see some sort of league table of reviewers. Let’s unleash the competitive streak: I am desperate to know whether I’m a low-level reviewer or a whizz. It would be nice too if the Guardian could keep us reviewers up to date with an email letting us know how it’s going. I don’t have a meaningful sense of what the Guardian is going to do with the info and if I had a better notion I might be more active. Day one of this crowdsourcing experiment was getting it started and keeping the wheels on and this morning thousands of more documents have been made available. But even with many hands making light work, this is going to take some time and I look forward to the Guardian honing and improving the way they’re engaging, recognising and communicating with the crowd who is making this all possible. I think you’re spot on, on the league table. Nothing like a bit of fun competition. Thanks for the excellent feedback – I couldn’t agree more on the date entry issue, I had a bunch of improvements I wanted to add to that but then we went live, the database started straining and I spent the 24 hours simply ensuring it would scale (we’re pretty confident with it now). First thing on Monday I’m going to start addressing the many usability issues with the current site. this is awesome work by the guardian thanks for posting it Dan and hope you are well! Interesting piece looking at the Guardian’s crowdsourcing on MPs expenses a few days in. I’m fascinated that so many people in the industry are so full of praise (which I agree with) but in terms of community engagement it’s been a bit of a flop for me. I think it looks a bit different after 400 pages reviewed. I’ve totally given up because I can’t see any fruits of my labour. The written pieces about what’s been found have been pretty thin and unamusing and it’s slid from the prime spot on the Guardian homepage. My interest has waned, as indeed has the Guardian’s it would seem.